When your body performs correctly, it’s like a well-oiled machine. Each part contributes to the overall well-being of an individual and when one part mis-fires, there can be a cascading effect. In the same way you get your physical, your vision checked, and practice good dental care, you should also be getting routine hearing exams at Pacific Northwest Audiology. Hearing healthcare is an important part of your overall health and well-being, though it is often overlooked because hearing is an “invisible” sense. In fact, hearing is related to many parts of your physical health – including your cardiovascular system. Statistics from the Centers for Disease Control indicate heart disease is the leading cause of death for both men and women with nearly 610,000 dying each year in the United States. Those with cardiovascular disease have a variety of different medical issues that affect the vessels and structure of the heart. The most common problem involves the narrowing or blocking of vessels which leads to chest pains, a heart attack or stroke. Other cardiovascular problems affect the heart’s muscles, valves or rhythm. The connection between heart health and hearing loss involves blood flow. Studies show proper circulation plays a key role in maintaining good hearing health. Inadequate blood flow and trauma to the blood vessels in the inner ear contribute to hearing loss. Why? Because the tiny oh-so delicate hair cells in the cochlea or inner ear play a very important role in processing the “noise” your ears collect into electrical impulses that your brain translates into “sound.” Poor circulation deprives the hair cells of oxygen and the oxygen starved cells are damaged or destroyed. These do not regenerate and could lead to permanent hearing loss. 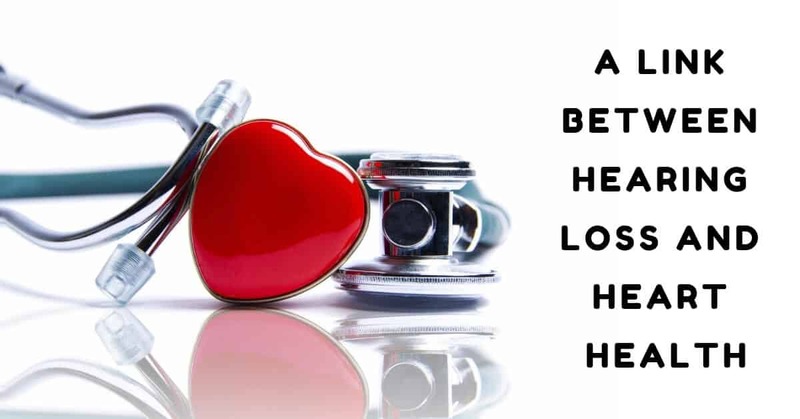 A study published in the June 2010 issue of the American Journal of Audiology reviewed research conducted over the past 60 years on cardiovascular health and its influence on hearing health. The study authors Raymond Hull and Stacy Kerschen concluded that impaired cardiovascular health negatively affects both the peripheral and central auditory system, especially in seniors. Get Moving – It Helps! Although sensorineural hearing loss – that’s hearing loss due to damaged hair cells – is permanent, you can protect your hearing by increasing your blood flow with exercise. Clear it with your physician, of course, but a fitness program that includes cardiovascular exercise is a great idea! Researchers have discovered a positive link between hearing sharpness and cardiovascular exercise. The study tracked 102 non-smoking volunteers aged 22 to 78. Their hearing was evaluated after they rode a stationery bike. They concluded those with higher cardiovascular fitness levels maintained better hearing, especially in the age group of 50 and older. At Pacific Northwest Audiology, we are all about maximizing your potential and keeping you on track with good hearing health. After a hearing test, we will review your results with you and if treatment is needed, we’ll work on the best solution that meets your needs. Maintaining your hearing is a part of your overall health and well-being. Hearing tests are painless, and they can contribute so much to your health!